Disclaimer: Today I am being honest. It wouldn’t be fair if I wasn’t. I love to share happy posts and share fun new things, but today I just can’t be 100% optimistic. 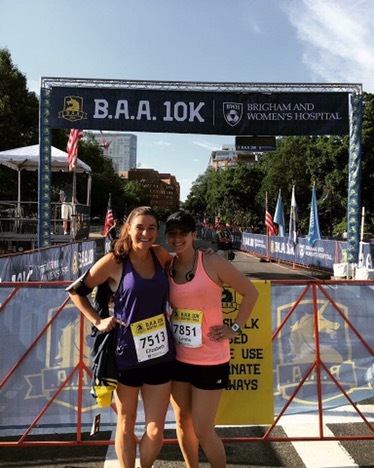 Sunday I ran the Boston Athletic Association’s 10K. For those of you are unfamiliar, the B.A.A. is the non-profit organization that hosts the Boston Marathon every year. They host a 5K, 10K, and half marathon as well throughout the year. As a runner, I have always dreamed of obtaining one of their medals. I did just that on Sunday. In case this is your first time reading, running has always been totally mental for me and I have had a really hard time calling myself a “runner.” I’m kind of over that phase now but running is never something I felt very confident about, but I continue to run and participate in races. I signed up to run for the B.A.A. 10K (my first) with my best friend who is currently training for a marathon, so a 6 mile run is short for her these days. I thought it would be best that we run in the corral we each felt comfortable in – I didn’t want to keep her behind, and I didn’t want to over exert myself trying to keep up. Besides, you never really feel like you’re running alone when you’re running a race. The B.A.A. 10K had almost 8,000 participants so I was far from lonely. The course was a great view of Boston and mostly flat. The only real tough part was the heat. I have mixed feelings after Sunday’s race. I set a very conservative finish time for myself because I like to set goals for all of my races, but also like to be realistic. I am disappointed to report that I came in over 7 minutes beyond that conservative goal. I should have been able to run 3-4 miles comfortably and from there I knew I would need to push a little bit. My joints were bothering me by mile two and my headphones died shortly after. Talk about a #hotmess. I’m not sure what factors were at play – my mentality, the heat, being anxious all week – but I simply was not on my A game on Sunday. That being said – I am still really proud of myself. I finished my longest run (ever) and ran my first 10K injury free! I trained a good amount, but I know I could have trained more. I am taking a lot away from this race probably because it wasn’t as successful as I hoped.